Drafted number one overall by the second year Milwaukee Bucks in 1969, Lew Alcindor instantly catapulted the Bucks to title contenders. With the addition of Hall of Famer Oscar Robertson the following season, Alcindor and the Bucks won the NBA title. Shortly after winning the NBA title, Alcindor officially changed his name to Kareem Abdul-Jabbar after converting to Islam in 1968 while still at UCLA. Before the start of the 1974-75 season, Jabbar requested to be traded to either New York or Los Angeles, citing that the Midwest did not fit his cultural needs. Ultimately, he was traded to the Lakers in 1975 and began a stretch in 1980 that saw him and the “Showtime” Lakers, with the arrival of Magic Johnson, win five NBA titles. Kareem’s unstoppable “skyhook” shot and defensive presence saw the Lakers reach the finals nine times in the 1980s. 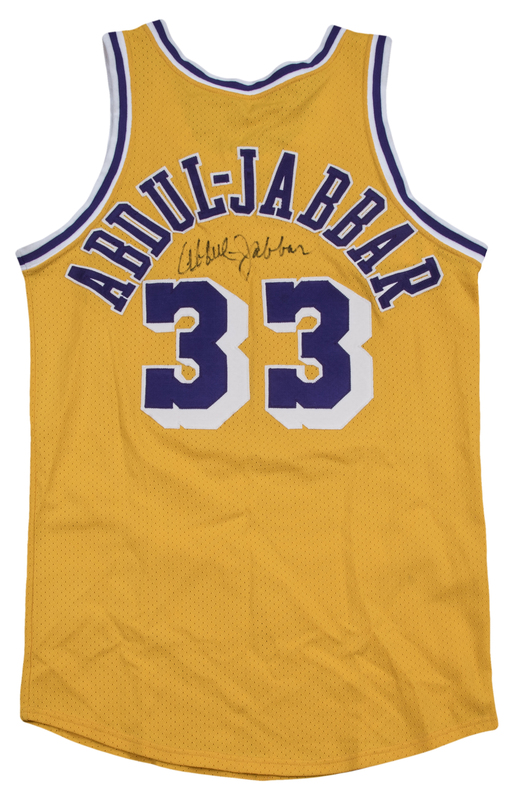 After his retirement in 1989, Jabbar was the all-time leader in points scored (38,387), games played (1,560), minutes played (57,446), field goals made (15,837), field goal attempts (28,307), blocked shots (3,189), defensive rebounds (9,394), career wins (1,074) and personal fouls (4,657). 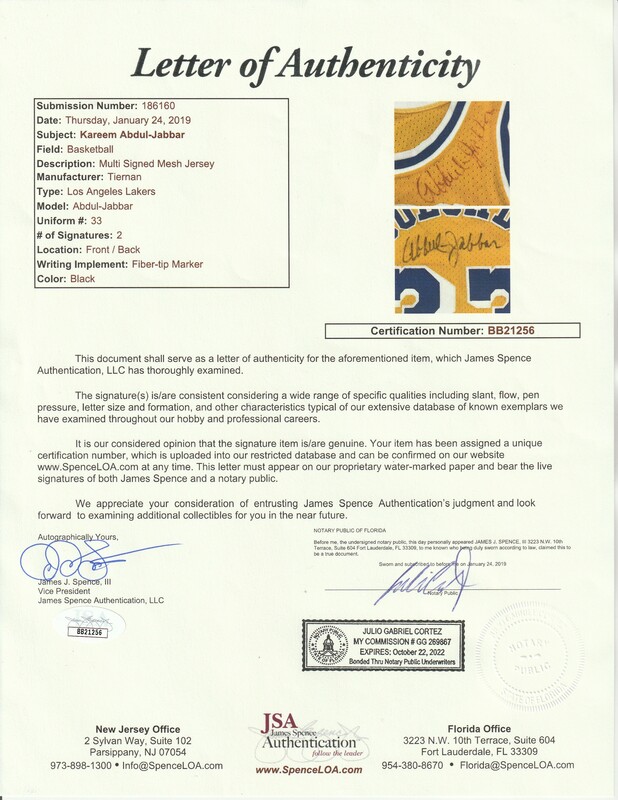 Offered is this yellow mesh Los Angeles Lakers home jersey worn by Jabbar during the period of 1980-1985. 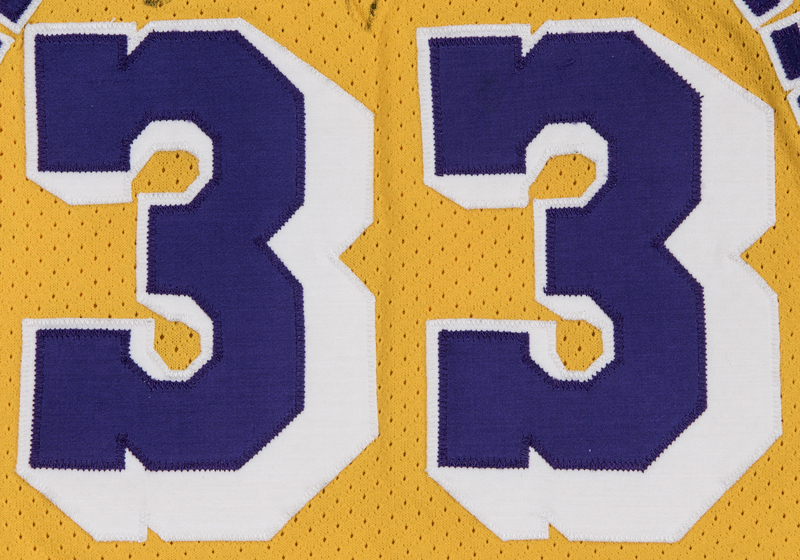 This jersey has “LAKERS” sewn on the upper chest in purple and white tackle twill with Jabbar’s number “33” sewn on below in purple and white shadow tackle twill. The neck and sleeve openings have white/purple/white band. 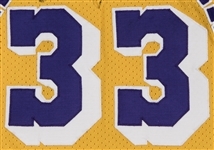 The back of the jersey has “ABDUL-JABBAR” sewn on in purple and white tackle twill with his number “33” sewn on in the same color pattern. 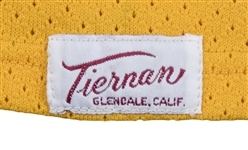 The jersey was manufactured by Tiernan of Glendale, California. 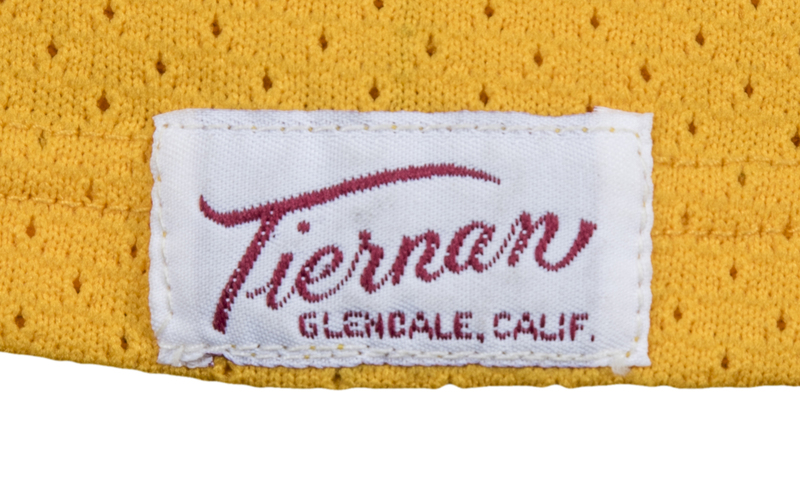 Tiernan was the official jersey supplier for the Lakers from 1975-1985 and from 1980-85, the purple numbering with white borders were used during this time frame. Tiernan used two styles of tagging according to the game used experts at MEARS. 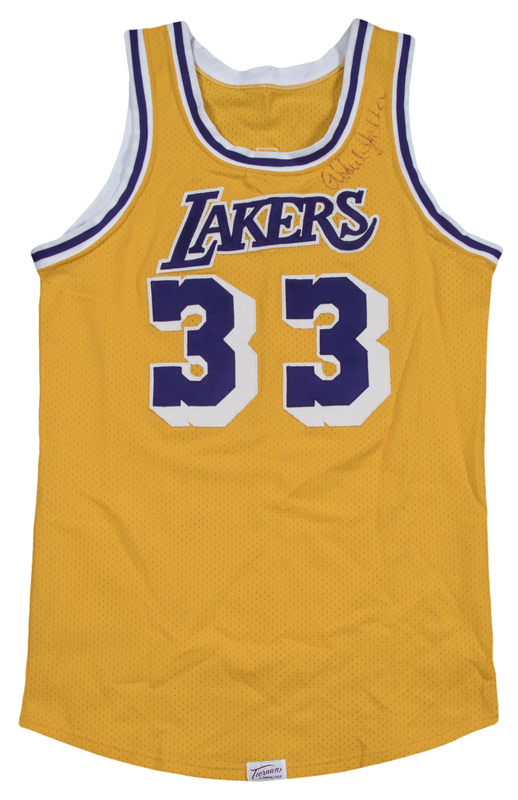 The printed version is seen from 1975 to 1985 and during the approximate years of 1982-85, the Lakers also used an embroidered tag, which is on the center tail of this jersey. Both style tags were used through 1985. 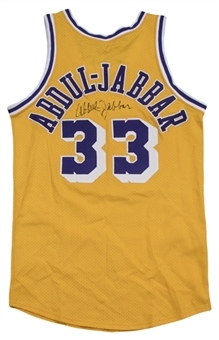 Kareem has signed his name twice on this jersey, once on the upper left shoulder in red marker and on the back of the jersey in black marker between his name and number. This jersey displays moderate game use and comes with a LOA from MEARS (316226), who have graded this jersey a perfect A10. It also comes with a full LOA from JSA (BB21256) for the signatures.